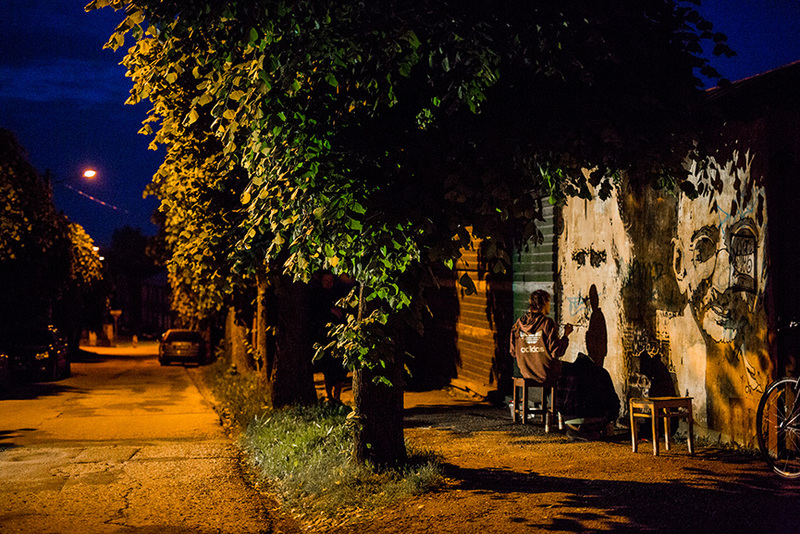 Stencibility is a street art festival happening in Tartu, Estonia and this year celebrating its 10th anniversary. 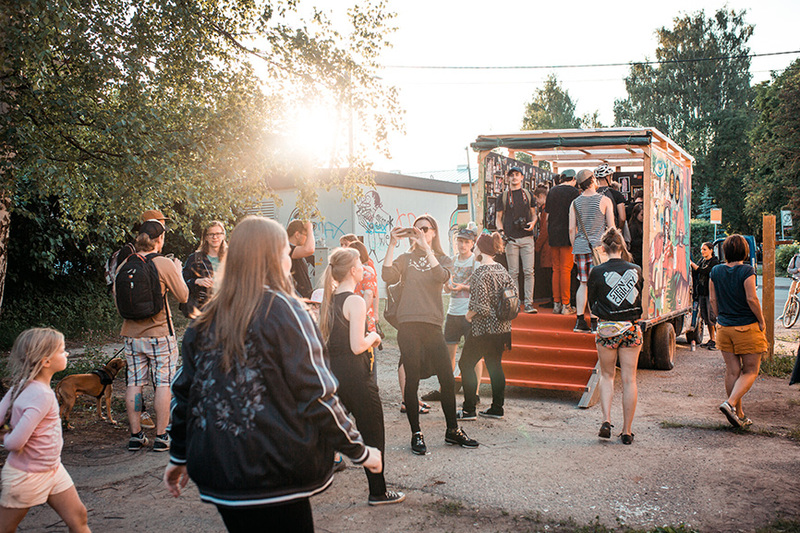 The festival has come a long way starting from a get-together of local street artists and now being the most important street art event in the Baltic region hosting international artists around the world. What makes Stencibility really unique is that it’s targeted to active illegal street artists. 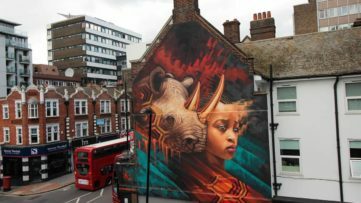 Most of the street art festivals are hosting muralists and there’s not too many events for stencil artists, sticker enthusiast, urban interventionists and artists who just like to go out at nights to paint the city. When I say independent street art, I mean that lot of people understand the definition of street art differently. 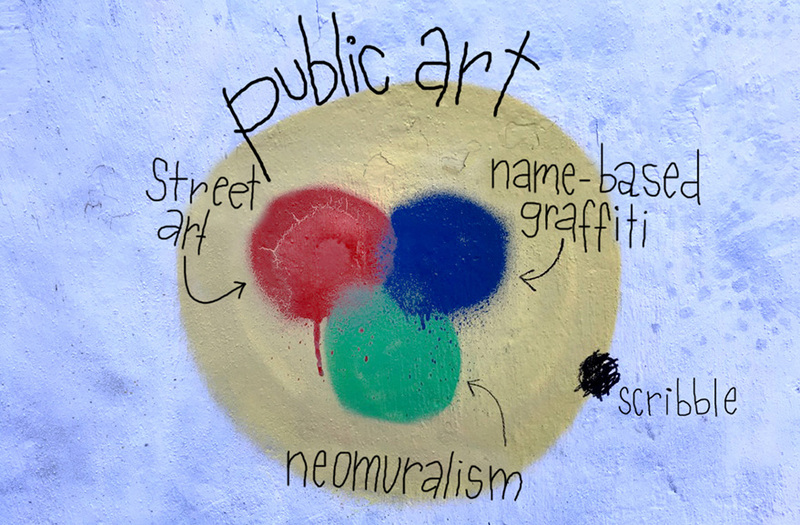 I see that there’s 3 most active art movements in public space: graffiti, street art and muralism. They are totally different movements but also have some similarities. Here’s a model I did for my Master’s thesis about the importance of illegal street art. I can say without exaggeration that more than 80% of street art festivals are mural festivals by my definition of street art – which is great for muralists but not that great for street artists. 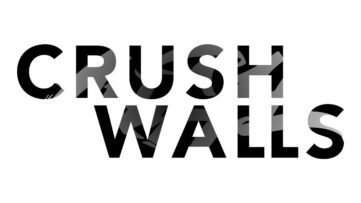 Stencibility also started with murals, but at some point we saw that we are actually working against our goals by focusing on murals. 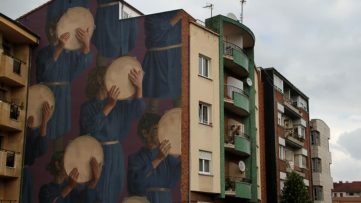 We saw that emerging active street artists are forced to do murals to participate street art festivals and there’s not too many alternatives that offer something else. 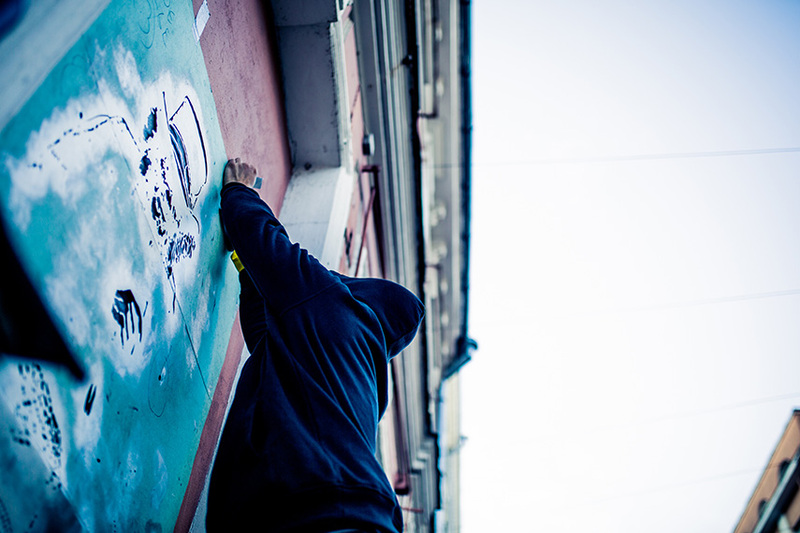 The goal of Stencibility is to support independent street art as an art movement. For me, the most important thing about street art is the artistic freedom – freedom to choose the location and the topic independently. Basically independent is just a fancy word for illegal. But not necessarily – sometimes it’s possible to maintain the independence legally, sometimes not. We started doing the festival for ourselves. We wanted to paint, but everyone knows how expensive spray paint is, especially when you go out every week. We realized that if we write a project and ask for funding from the city and cultural ministry, we will have lots of leftover paint after finishing the official part. Every festival, we organized an unofficial side event to make the most out of the leftover paint. We called it the OFF program and that turned out to be the most fun part that everyone absolutely loved. After a few years of doing that, we made it to an official side event at 2018 and started experimenting with the model. The idea was to mimic the illegal street art action as well as we could in the frames of an official festival. We went to look for smaller walls to use for our festival and came up with the concept of donated walls. Donating a wall means that the owner gives the permission to paint on it without controlling the content. This way we could let the artists work organically without the need to approve the sketch from the distance. When arriving to the festival, the artists have a map with the painting locations marked. No one could reserve a wall and everyone could paint all the locations during the festival. In addition to painting, we offered the artists a movie night in a skate hall, a drink and draw event, some lectures and workshops. This year, for the first time, OFF program has become our main program. In addition to that we are doing other non-mural stuff: hosting an international sticker exhibition SLÄP!, hold a sketch contest “My first wall” for school kids and active artists who draw but not on the walls yet, and last but not least – publish a zine about street art in Tartu and the concept of independent street art. Sometimes I have a feeling that Stencibility isn’t even a festival, it’s more like an art movement gathering people who think the same about street art. And we are happy to provide this platform. We have launched an open call for our main program with the deadline of 22nd of April to apply. More information can be found on our website. 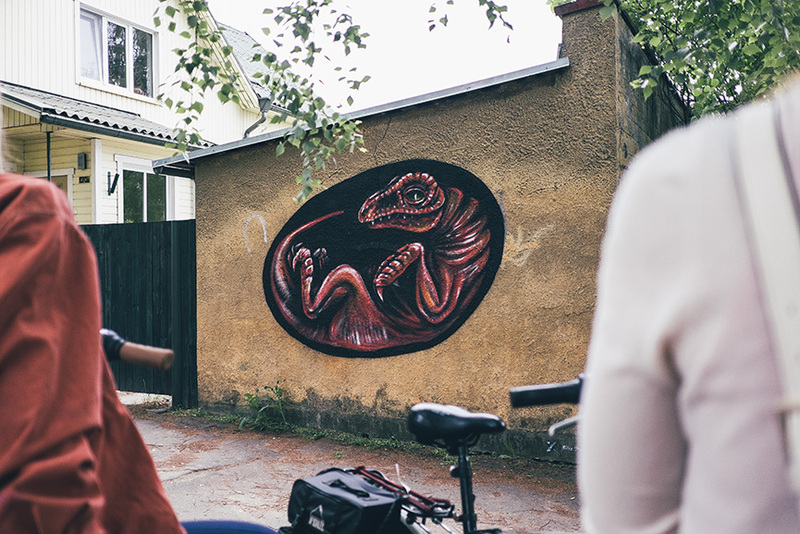 Featured images: Stencibility Street Art Festival Estonia; Hapnik, Stencibility 2017; Silex Project, Stencibility 2018. Photos by Ruudu Rahumaru, courtesy Stencibility. Denver’s Urban Art Fest is About to Crush It!